Preheat oven to 350 degrees F. Lightly grease a 2-quart baking dish. Cut each of three tortillas into six wedges; place in the bottom of the prepared baking dish. Set aside. Cut the remaining three tortillas into thin bite-size strips; place on a baking sheet. Bake, uncovered, about 10 minutes or until crisp. Meanwhile, in a medium bowl, combine salsa, the 1/2 cup sour cream, flour, and dried cilantro. Stir in shrimp and corn. Spoon shrimp mixture over tortillas in dish. Bake, uncovered, for 40 to 45 minutes or until heated through. 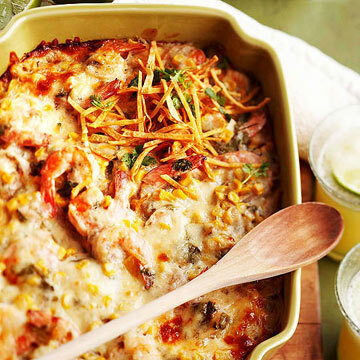 Top with baked tortilla strips and cheese. Bake, uncovered, about 5 minutes more or until cheese is melted. If desired, garnish with fresh cilantro, additional sour cream, and/or tomato. Makes 4 servings.